When Aaron and I left for our year-long road trip last year, I had to say goodbye to making my homemade kombucha. I’ve heard of people toting around their sourdough “mothers” with them wherever they go, but bringing along a scoby? Not so much. So I said my farewell and figured I’d get back into brewing kombucha when we were settled in again the following year, except this past summer I decided to try fermenting a new-to-me drink: water kefir. Have you tried water kefir before? Basically, it’s created from water kefir grains, which are made of bacteria and yeasts (they’re dairy-free and grain-free, but are called grains because of how they look). 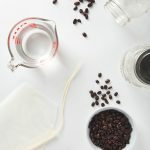 Similar to a kombucha scoby, the kefir grains ferment sugar in a water solution to create a naturally fizzy and probiotic beverage that’s similar to soda. But unlike kombucha, water kefir doesn’t contain caffeine and the flavor is mild and sweet, not tangy and vinegar-y. I especially like it because the fermentation process takes about two days instead of a week, and also the grains are not nearly as unattractive as a scoby! The benefits of water kefir are similar to other probiotic-rich foods. The healthy bacteria help to repopulate our guts and boost our immunity—both things that are especially nice during cold and flu season. Just like taking a probiotic supplement, I find that drinking water kefir helps me digest foods like beans and cruciferous veggies and keeps bloating to a minimum. The process of making water kefir at home is very simple. I use grains that I purchased from Kombucha Kamp (I bought my kombucha scoby from there too), and then all you really need is water, sugar, and a couple of glass jars. I like to use a mix of three parts organic cane sugar and one part coconut sugar with a lemon wedge and prune thrown in (the last two are optional, but like coconut sugar, they increase the mineral content and promote faster growth of the water kefir grains). You can drink water kefir after the first fermentation, although I find the taste to be too bland as-is. That’s why I always do a second fermentation with whatever fresh or frozen fruit I have on hand. 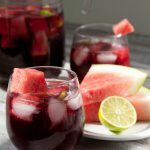 My favorites are watermelon in the summer, apple cider in the fall (juice works too! 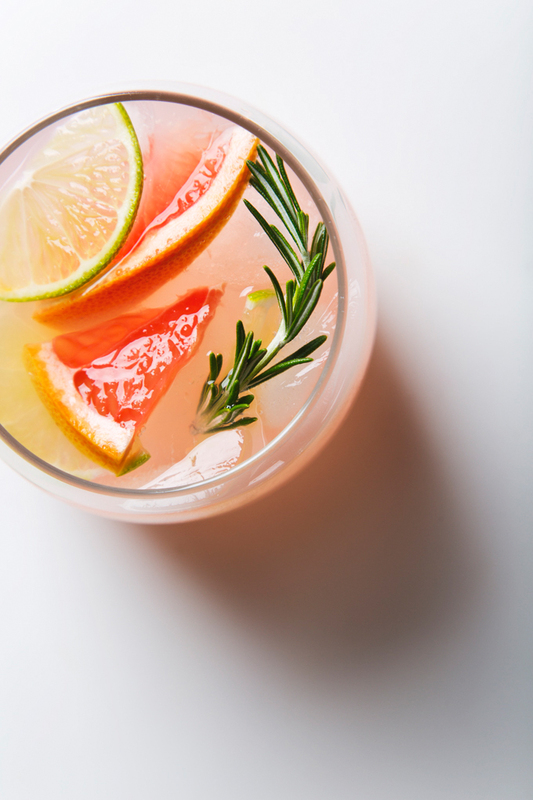 ), and recently I’ve been all about the flavor you see in the photos: pink grapefruit, lime, and rosemary. 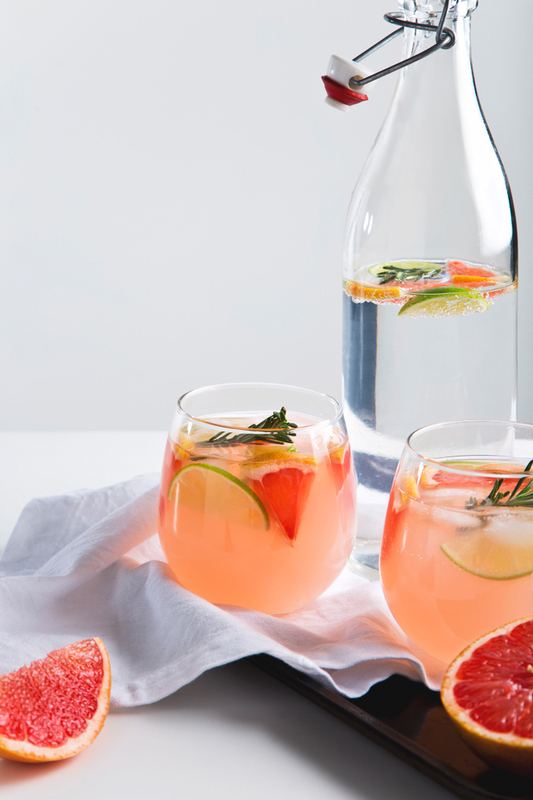 I squeeze about half a grapefruit’s worth of juice into the bottle, add a few small grapefruit and lime wedges, and then a sprig or two of rosemary for a subtle earthy flavor. It’s like a good-for-you spin on a paloma cocktail that tastes incredible! 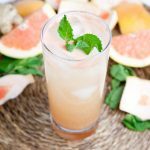 If you’ve been looking to dip your toe into homemade fermented foods or you don’t love the tangy flavor of kombucha, I highly recommend giving this water kefir recipe a try! It’s easy, fast, and super affordable to make at home. P.S. I’ve linked a few of the ingredients/supplies in the recipe to the ones I use and recommend. Be sure to check the recipe notes for a few other pro tips too. Easily make healthy water kefir at home with just a few simple ingredients! The process is straightforward and only takes a couple of days. 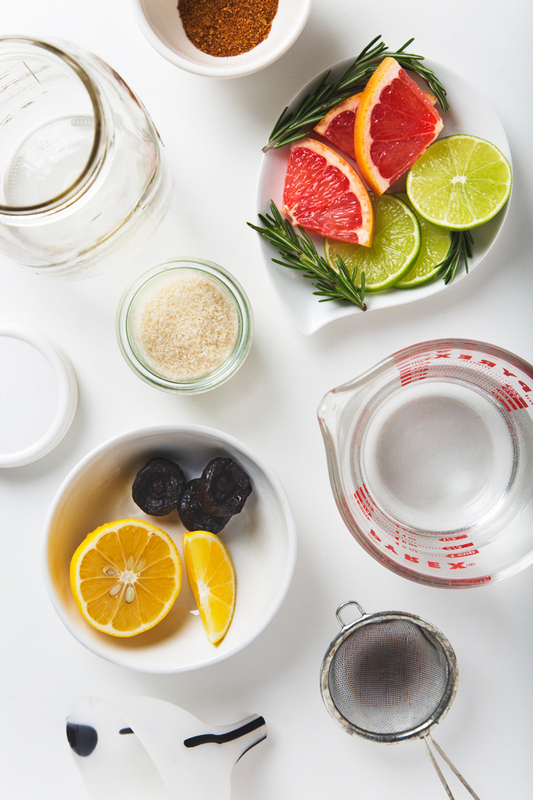 Feel free to flavor your water kefir with whatever fruits, herbs, and spices you like! Add the sugar to an empty 32 ounce glass jar, then pour in the cooled water until it reaches an inch below the top of the jar. Stir to dissolve the sugar. Add the kefir grains to the jar, followed by the lemon wedge and prune. Screw the plastic lid on the jar and place it in a warm, dark spot (a kitchen cabinet or pantry works well). Allow it to to sit for 1-3 days, then taste the water kefir. You'll know it's ready to bottle when it has a mild, sweet flavor and it's slightly bubbly like soda. Add about ½ cup of fresh or frozen fruit to the empty bottle with the stopper and place a funnel on top. 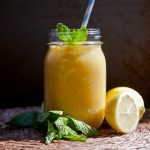 Remove the lemon wedge and prune from the jar of water kefir, then pour the kefir into the bottle, straining out the kefir grains with a small sieve. Set the grains aside for the next batch. Secure the rubber stopper on the bottle and allow the water kefir to ferment for 1 more day in a warm, dark spot. After 1 day, carefully open the stopper and "burp" the bottle to release any pressure, then move it to the fridge to prevent further fermentation. Repeat this process for your next batch. Water kefir grains thrive when they have access to minerals. That's the reason for including the coconut sugar, lemon wedge, and prune. I notice my kefir grains grow more quickly this way. If your grains grow to exceed two tablespoons, start a second jar or gift the extras to a friend. Using coconut sugar and prunes will cause your kefir grains to turn a pink-ish color. This is totally fine. I've had extra fizzy results flavoring with strawberries, watermelon, and pineapple (more sugar = more fizz). The key to really bubbly water kefir is using a bottle with a tight-fitting stopper. The flavor of water kefir should be much more mild and less vinegar-y than kombucha. The fermentation process is also a lot faster. In warmer environments, it will complete the first fermentation in about a day. « Your Top 10 Favorite Recipes of 2016! I’ve never even heard of water kefir, but it sounds so good! I do love kombucha, but my habit can get expensive fast and this looks like a perfect alternative to get those probiotics in. Cheers to Friday! This sounds delicious! I don’t have a way to boil water right now, but once I do, I’ll definitely be trying this! Hi Megan! I boil the water to remove the chlorine. Another option is to let the tap water sit overnight so that the chlorine can evaporate. Oh, that’s good to know! Are the prune and bottle with a stopper necessary? Or would like, a mason jar work? I work seasonally so my resources are a bit more limited since I have to pack and move every few months. The prune is optional, but helps provide minerals to the kefir grains (which makes them grow faster). You can also use a few raisins. A mason jar will also work, but the kefir doesn’t get nearly as fizzy as using a bottle with a stopper. Eep! I am so excited to try this Amanda! I had forgotten this was on my list last year to try, and then this popped into my inbox this morning kindly reminding me ;). I wonder, could I use another sweetened other than cane? Like all coconut? I have a slight allergy to cane and have had to give up kombucha this last year (sad face). Hope you two are staying cheery this winter in Boston! Hugs. Jessie! Yes, you can absolutely use another sugar. All coconut will work, or something like turbinado. It will obviously turn the kefir a darker color and alter the flavor just a bit, but no big deal! I’m sorry you’re having to work around these food allergies, although you do seem to be making the best of it. I did an elimination diet a few years ago because I was having reactions, and it turned out I was allergic to basically everything environmental—pollen (causing cross-reactivity with food), mold, dogs (oops), cats (oops again!). All that said, it’s still such a relief just to know and be able to make changes. I’ve been wanting to try this for a while, and your beautiful pictures might be just the push I need! How do you store your kefir grains in between batches? Thanks! I pretty much always have a batch going, but you can store the kefir grains in sugar water in the fridge for up to a month I think! I used sucanat bc I didn’t have regular cane sugar. Think this is ok? Thank you so much for the helpful guide on how to make water kefir! Very useful for those trying to transition into a more healthy drink for their life! Thanks for sharing! Thank you, Billy! I’m glad you found the water kefir guide helpful (I’m sipping some as a write this, actually 🙂 ).